Yves Saint Laurent, circa 2000. 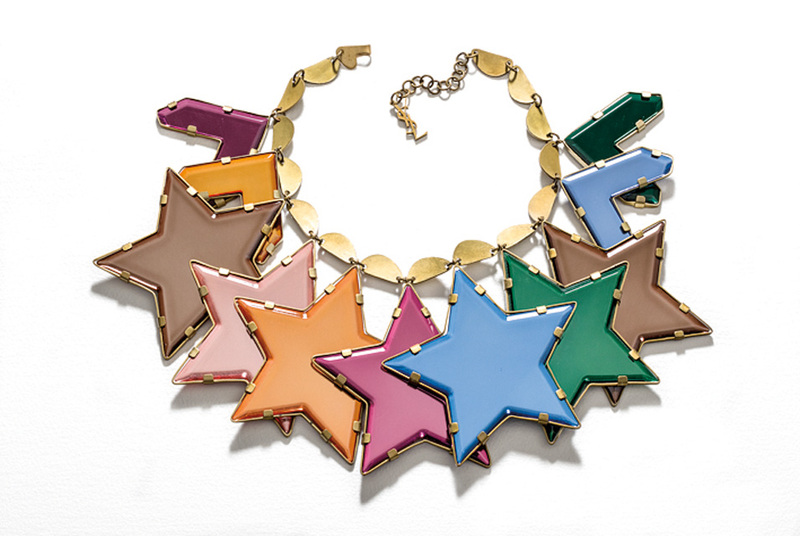 Star motif necklace. Mirrors, gold plated. Signed YSL. Photo: © Pablo Esteva. NEW YORK, NY.- Fashion Jewelry: The Collection of Barbara Berger is an eye-opening presentation of necklaces, bracelets, and earrings, many of them one-of-a-kind, drawn from the world-renowned collection of Barbara Berger. Featured designers include Kenneth Jay Lane, Lanvin, Missoni, Oscar de la Renta and Pucci. The exhibition is on view at the Museum of Arts and Design from June 25 through September 22, 2013 (a portion of the exhibition will remain open until January 20, 2014). "To talk about collecting costume jewelry is to talk about life, style, heart, and passion. Collecting is a treasure hunt, and completing my collection has been one of the highlights of my life," said Berger. "My collection features what's interesting to me  extraordinary, unique designs imbued with fantasy and a sense of humor. It's usually love at first sight." Fashion Jewelry is being presented in an elegant installation that celebrates this glorious jewelry. The first section in MAD's jewelry gallery surveys the range of designer works by the American and European houses, including Chanel, Balenciaga, Maison Gripoix, Marcel Boucher, Miriam Haskell and Trifari, to name a few. This showcases not only the historical relationships between the houses and their designers, but also reveal their distinct signature styles and motifs. This section of the exhibition will remain on view through January 11, 2014. In the main gallery, work is being presented thematically, with pieces variously arranged by subject, material, geography, color and motif. From flora and fauna, to rhinestones, gold and resin, this section will be on view through September 22, 2013.